This statistic presents mobile share of consumer spending on Alibaba's Tmall and Taobao e-commerce properties during the 24-hour Singles Day sales. In 2017, mobile buyers on tablets and smartphones accounted for 90 percent of GMV. 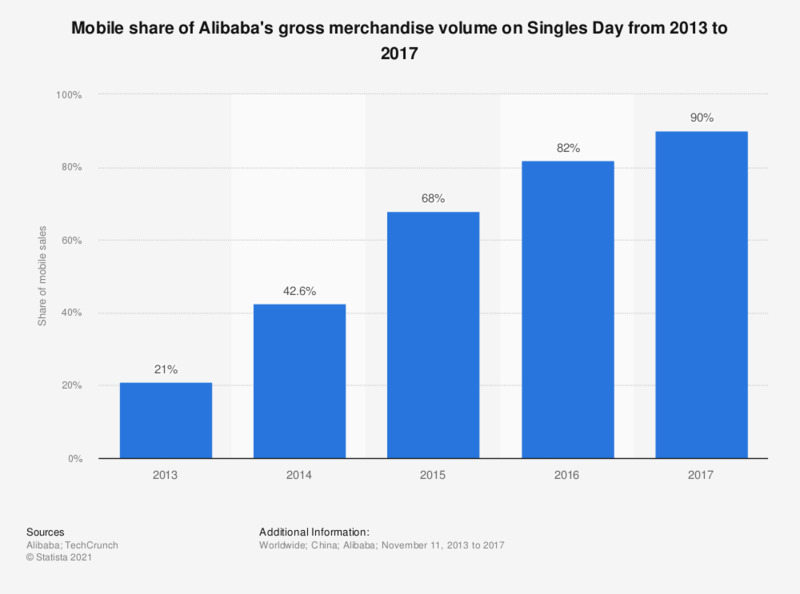 In 2009, Alibaba Group created the connection between Singles Day and online shopping as the company tried to generate sales for its Tmall unit by offering special pricings and promotions within a 24 hour period. Today, Singles Day online sales surpass U.S. Cyber Monday sales by a wide margin. Consumer spending on Alibaba's Tmall and Taobao Singles Day (11/11) sales.